The Luft Side Chair is about creative freedom. It takes inspiration from a classic design and brings it someplace that is new and interesting. The result is a design that is so naturally cohesive that its literal abstraction of Eero Saarinen's Tulip Chair seat is almost illusory and hidden from plain view. The Luft Side Chair proves that with a fresh perspective a modern classic can be reinterpreted and given new life. The Luft Side Chair re-imagines The Tulip Chair as a modern Danish design that digs deeper into its own lineage. Its solid European Beech wood base features a subtle wood grain and natural finish that provides a characteristically Scandinavian accent to its sleek softly-matted white seat. Its padded leatherette seat provides the layer of comfort and support you need to cherish this design for its function as well as its form. We ordered the black with gray cushion, /! 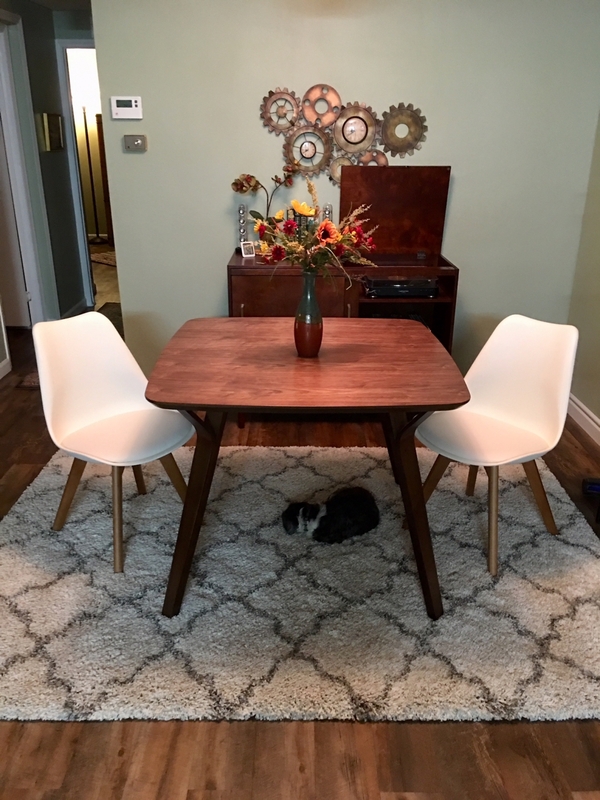 ; they're solid and perfect for our Scandinavian/mid mod dining room. I love everything about this chair! I love the looks and the comfort of this chair. The cushion adds a great deal to the comfort level and the fact that this chair is different from all the others that have the wood and wire base makes it even more appealing! Cover it with a shaggy faux fur throw and you have a tres chic piece of furniture. Very happy with this affordable purchase! These chairs are seriously a bargain and for the quality, you can't beat them! Love the way they look and love the way they feel, thanks! I bought a set of Beech with Gray cushion chairs. There was no stock available when I ordered but I received an in-stock notification in about 3 weeks. The delivery was fast and the chairs were exactly what I had expected. The chairs were easy to assemble although one of the four screws on the chair appears to be very difficult to screw all the way in. Love the white color and the comfort of the cushion. Waited (not always patiently) four months for the Luft white with walnut legs to come off back order/ And was not disappointed. Checked all my boxes: solid construction, easy to assemble, comfortable, one-of-a kind mid-century look. Even my dog loves 'em! Love these chairs! Everything I wanted & more! Thank you for the awesome prices and easy shopping experience! Walnut legs with black seat and gray cushion is a BEAUTIFUL COMBO! I highly recommend! Kinda wish the seat cushions weren't attached to the frame. The chair is comfortable and the legs are supportive. They make excellent dining chairs and match my dining room nicely. Recommend ordering these in one pair of white and one pair of black, the contrast is super contemporary in a kitchen with black and white features - beech wood base breaks up the monotony as well - love the way they look! gray cushion instead of black cushion? I've had my eye on the classic eero saarinen design for a while now but I didnt want to go for an exact reproduction, I was so happy to have found these, They are of a similar design and the cushioning is a bonus, thank you! The chair looks good but every month my husband has to rescrew the bolts in on the bottom. Also the cushion can't be detached so if you spill something it's pretty much stuck under there. Timeless design that fits beautifully in our dining room! Items arrived in perfect condition. Very happy with our purchase! I've very pleased with this updated version of the tulip chair. Excellent value. Consdoes not swivel like the original tulip chair. I ordered four of these chairs for my dining room table. They look great, are very comfortable to sit in and come at a great price point. Assembly was also super easy. Highly recommend these chairs. The Luft Side Chair is not stackable. Any way I could get the beech legs & grey chair/cushion? Unfortunately we are unable to open up boxes and mix and match parts. How much do these chairs weigh? Each chair weighs about 12 lbs. Is the walnut colour more on the brown side or red side? The walnut finish is going to be more of a brown color. Does the cushion detach for cleaning? The cushion on the Luft Side Chair is attached to the seat, and is not removable. 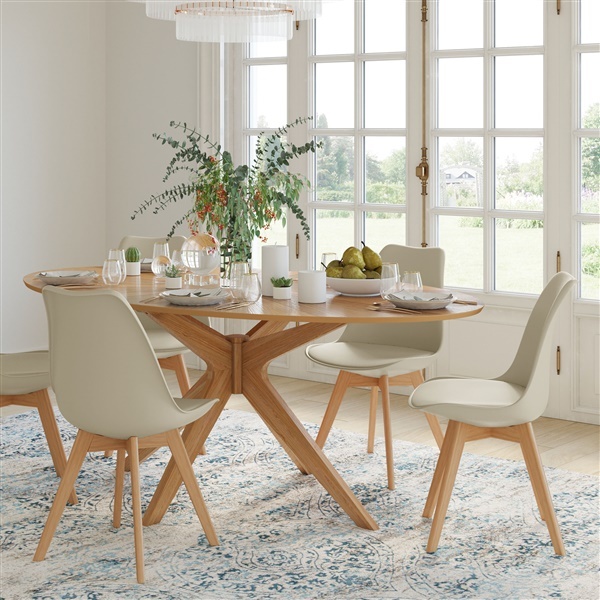 What is the weight capacity of these dining chairs? The Luft Side Chair is rated for use up to 250 lbs. How can I order just 1 chair? We are only able to sell the Luft Side Chair in quantities of 2, as the manufacturer boxes this item in 2's for shipment. This chair is made in China. is it 89$ for each chair or for a set of two? What material is the chair - not the cushion or the legs. The price shown for this product is the price per chair. The seat is made from polypropylene. is this chair color bright white or creamy white? The Luft Side Chair is a creamy white color. does this chair come in other wood colors? The Luft Side Chair only comes as pictured in this one color wood. How much is the weight support?? This chair is rated for use up to 250 lbs. What is the seat height of the Luft Side Chair. The seat height for the Luft Side Chair is 18".